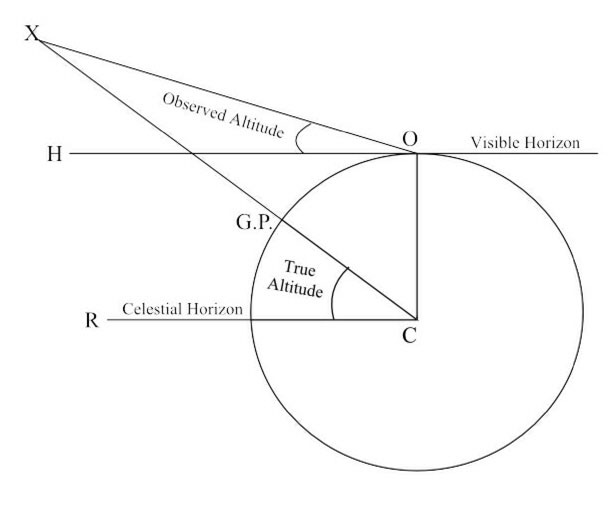 As shown in the following diagram, the observer measures the altitude in relation to the visible horizon from his position at O on the Earth’s surface. So, the observed altitude is the angle HOX. However, the true altitude is measured from the Earth’s centre in relation to the celestial horizon and is the angle RCX. Parallax. We measure the altitude of a celestial body from our position in relation to our visible horizon; this is known as the observed altitude. However, when calculating the true altitude, measurements are made from the Earth’s centre in relation to the celestial horizon. The displacement between the observed position of an object and the true position is known as parallax. Parallax corrections for stars and planets. Because the stars and the planets are at such great distances from the Earth, we can assume that, in their cases, the celestial horizon and the visible horizon correspond with very little error. However, in certain cases when extreme accuracy is needed, parallax corrections for Mars and Venus are required and these are listed in the altitude correction tables. Parallax corrections for the Sun and the Moon. Because the Sun and the Moon are relatively close to the Earth, parallax will be significant and so a correction has to be made. These corrections are included in the altitude correction tables and therefore do not have to be applied separately. This entry was posted in astro navigation, Astro Navigation Topics, astronomy, celestial navigation and tagged astro navigation, celestial navigation, navigation. Bookmark the permalink.